People who commit fraud and take commissions will be punished severely during his administration, says Opposition Leader Mahinda Rajapaksa. He pointed out that the incumbent government is responsible for the prevailing crisis in the country. He mentioned this following an event held in Welimada area yesterday (31). Meanwhile, addressing a function held at Balangoda earlier today, he said that the public has been oppressed due to the administration of the current government without any proper management. Stating the current government runs the country without any management, focusing only on taking commissions, he says that the political leaders of this government have no idea on the sufferings of the general public. 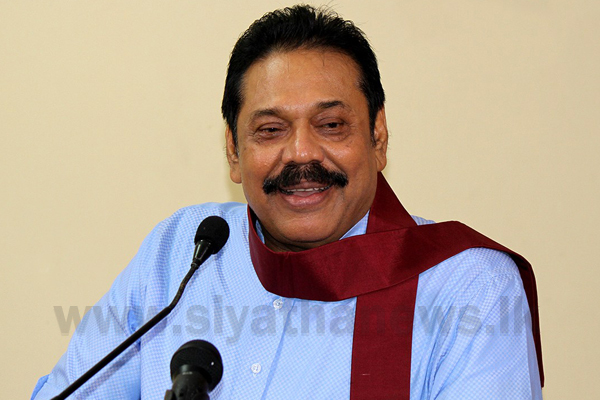 The government is run with the support of the Tamil National Alliance, said Rajapaksa. “This government is a defeated government. Not just us politicians, but even the people just watch the country deteriorating by the day,” he added. According to Rajapaksa, there is no place for Buddhism in the new constitution and that it mentions only of a ‘religion’ instead of ‘Buddhism’. “These days antiquities and ruins are bulldozed. This government was trying to build houses by flattening Vijithapura ruins. Even forest reserves are deforested today. If we continue to just watch this, the country will end up a desert,” said he. The Opposition Leader, attending a function at the Carlton kindergarten in Maligawatte, stated that a winning candidate will be presented for the upcoming presidential elections.